This year, DownStreet Art is especially interested in proposals from artists and curators that will activate DownStreet Art beyond “DownStreet Art Thursday’s”. Examples would include proposals that have an ongoing interactive element, temporary outdoor installations, exhibitions that encourage participation or proposals for works-in-progress that will culminate in a performance or exhibition opening. We are seeking quality work in all media including but not limited to, drawing, painting, sculpture, mixed media, photography, performance and multi-discipline work. 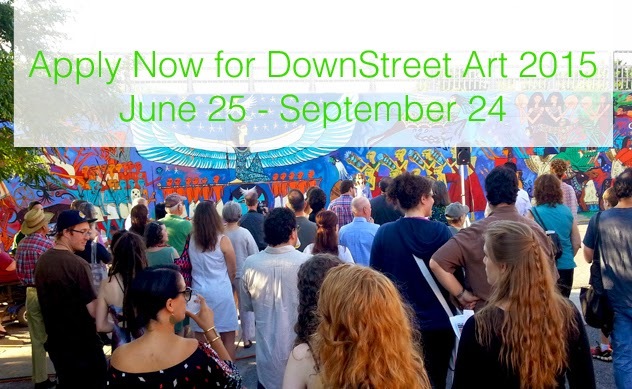 DownStreet Art is an excellent opportunity to have your work/project showcased in an art-friendly community and to be part of a larger discourse about contemporary art. Please visit our website for more information and apply by April 5th!